Crab Cake Grill Basket & Press | Patio and Hearth Co.
Now you can cook crab cakes on the grill! 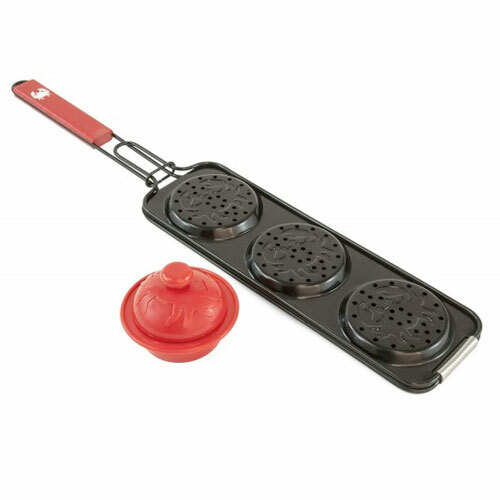 Balls of crab meat are instantly transformed into perfect patties with the two-piece plastic press, and held together in the locking basket during the cooking process. Prepare your favorite crab cake recipe and place a small amount inside the press’s bottom portion. Place the lid on top, press, remove the lid, and then turn the press upside-down, giving it a quick tap on your work surface to release the pressed patty. The patty is now the exact right size and shape for the grilling basket. The three wells are non-stick and feature small ventilation holes to let moisture escape, ensuring your patties are never soggy. Flipping the patties is incredibly easy; a turn of the wrist is all it takes to make sure your crab cakes are cooked evenly on each side. Use the basket over an open fire, charcoal grill, or gas grill, and you’ll have hot and delicious crab cakes with tender insides and golden-brown outsides. Inquire about Crab Cake Grill Basket & Press using the form below.